Kulunga Moort Mia is a culturally sensitive space where Aboriginal families can rest or make refreshments during their hospital visit. Run by Ronald McDonald House Charities Western Australia (external link), Kulunga Moort Mia is located next to the Family Resource Centre on Ground Level at the northern end of PCH. Developed in consultation with the CAHS Aboriginal Health Leadership and Advisory Committee (AHLAC), the lounge provides a space for families to meet with PCH’s Aboriginal Liaison Officers for support and information about services. Kulunga Moort Mia is also home to Djerapin, one of the PCH’s large scale artworks. Created by seven artists from the Kidogo Art Institute, Djerapin, which means ‘happy’ in the Noongar language, features two glass walls printed with richly coloured Aboriginal designs and five dog sculptures, back-lit with a changing sequence of LED lighting. 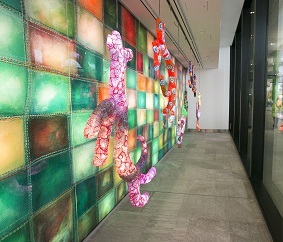 Facing Hospital Avenue, the artwork welcomes patients and families as they arrive at the main entrance of PCH. Kulunga Moort Mia is open Monday to Friday, 8.30am - 5.30pm. Kulunga Moort Mia is located next door to the Family Resource Centre, on the Ground Level (external site), near the northern entrance.